Best time to buy a car: If you’re in no rush to buy a car, the end of a model year is a great time to get a deal. Determining when this is for a particular car can be difficult, but if a dealer has two years of a new vehicle on its lot (say, 2015s and 2016s), chances are the older ones are going to be priced to move. The last week of the year is another good time to buy. You’ll find lots of specials and manufacturer incentives at both times of year. Trading in your car: A dealer may give you a token discount on a new car, and then make up for it by giving you less for your trade-in. You can avoid this by knowing the value of your current car before you go shopping. This depends on its age, mileage, condition, trim level, options, and your geographic area. To get an idea of your car’s worth, (a) check its “book value” at used-car-pricing websites, such as Kelley Blue Book and the National Automobile Dealers Association, (b) check car-buying websites and local classified and dealer ads for models similar to yours or (c) get an appraisal—take your car to the used-car department of several dealers or used-car lots and ask what they would give you in a straight-up sale. Buying a used car: If you can choose between a certified pre-owned (CPO) car and a non-CPO used car, go with the CPO. The selling price will likely be higher, but there are some significant benefits beyond just the extended warranty that comes with a CPO car. Carmakers review vehicle history reports for past problems and pay close attention to overall vehicle appearance. Also, if you’re financing your used-car purchase, you’re likely to get a lower APR on the CPO car, which can help you save interest charges over the life of the loan. Financing your car: Financing your new or used car at the dealership may seem like the easiest option, but it’s not necessarily the best deal. Dealers are essentially acting as middlemen to offer you a car loan. They get paid for every loan they write, whether the loan is through the automaker or a local lender. While it is possible that you may get the lowest car loan interest rate at the dealer, you’re likely to find that it pays to shop around first. Be especially wary if a dealer offers you a car loan at a rate that is far better than other lenders. Sometimes, dealers entice prospective customers with rates to get them to sign a contract to buy a car. Read all contracts carefully to make sure that the interest rate is not contingent upon approval. 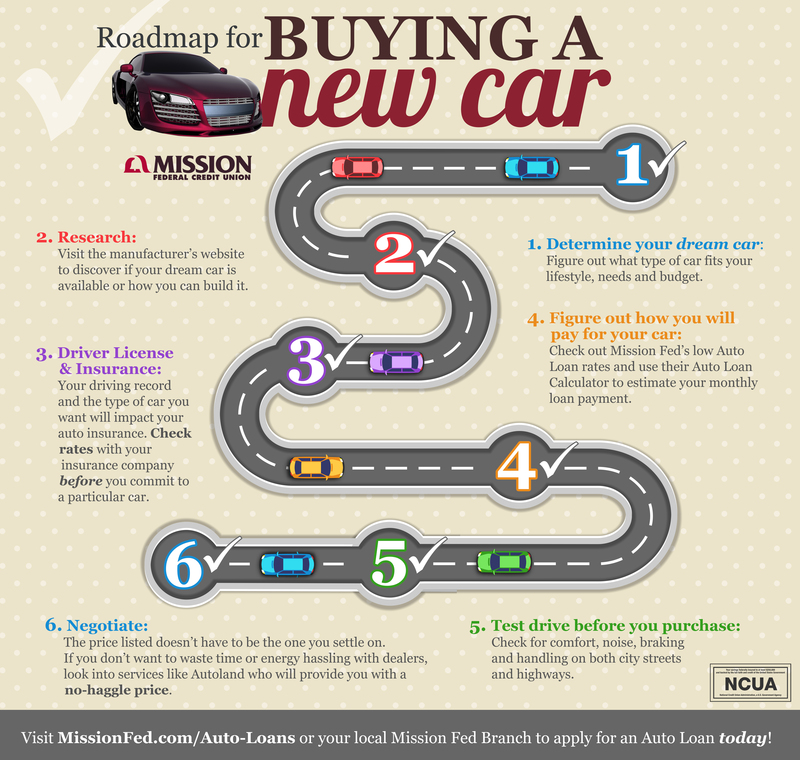 Leasing a car: Lower monthly payments and less money down can make leasing seem like a great deal. The truth is that leasing offers a lot of convenience, but only if you are willing to put up with restrictions, which can include lower mileage limits (typically only 10,000-12,000 miles per year), diligent upkeep and care of the vehicle and, in some cases, penalties for early termination. You may be a good candidate for leasing if you prefer to have a new car every few years, put limited miles on your car and/or can write off your car lease as a business expense. Enjoy your car search and be sure to take a look at our Auto Loan rates, too. You can apply online today for your car loan with our easy application, and receive a response in minutes. This article contains links for websites that Mission Fed does not control. Mission Fed is not responsible and does not assume liability for the operations, content, links, privacy or security policies of third party websites. Mission Fed thanks you times a million | Three cheers for Chip Cards (and 5 reasons they’re great)! Donna Handwerger is VP Marketing Operations at Mission Federal Credit Union. She has over 20 years of experience in financial services. She started her career in sales and operations, with the last 15 years in Marketing, and excels in analytics. A great deal of responsibility comes with getting your first credit card, so learn how to use your new credit card properly and keep your credit history on the right track. Keep your credit score looking good by following these first credit card tips.